If you find yourself groggy and slow-thinking during the day, you may not be getting enough sleep. But who keeps track of things like how long you spend in bed every night? 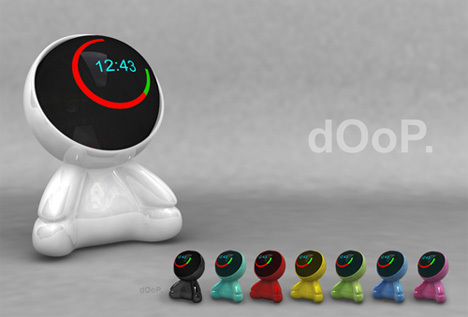 This adorable clock concep, called dOoP, from Singapore designer Tan WeiHao Rios would help you do just that, along with waking you up in a kinder, gentler way. Traditional alarm clocks are there just to help you wake up, but dOoP actually helps you improve your sleep by giving you a visual reminder of how long you’ve been in bed. You would presumably hit a button when going to sleep to let the clock start counting down your requisite eight hours. Throughout your sleep cycle, the red bar slowly changes to green as time passes. When the bar is entirely green, you’ve slept a full night and the clock wakes you up. 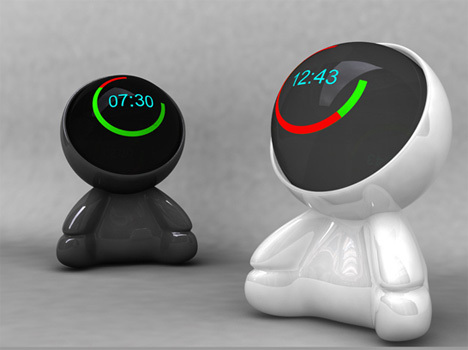 The dials on the face of the little humanoid creature-shaped clock can either count up to eight hours or down to the time you should wake up. And in the morning, dOoP wakes you up with both light and sound, providing a multi-sensory morning experience. For notorious workaholics who are tempted to get up early, something like this clock concept could be just the thing they need to remind them how precious sleep is. See more in Clocks & Watches or under Gadgets. November, 2009.